Logitech G102 IC PRODIGY Gaming Mouse Optical 6,000DPI, 16.8M Color LED Customizing, 6 Buttons -International Version- Bulk Package. 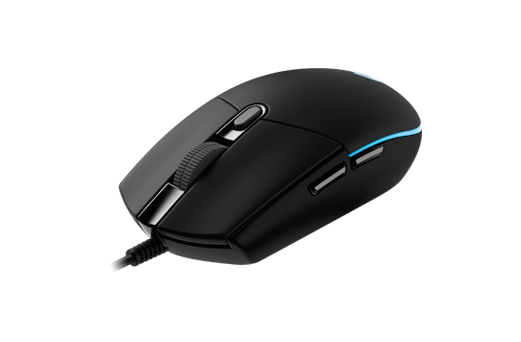 G102 is inspired by the classic lines and simple construction of the legendary Logitech G100S Gaming Mouse. Beloved by gamers worldwide and a favorite of esports pros, it’s a familiar design we have reimagined and optimized from the inside-out for versatility, durability and comfort for everyday use. G102 Prodigy communicates at up to 1000 reports per second – or 8 times faster than standard mice. This means when the mouse is moved or clicked, the on-screen response is near-instantaneous. Advanced button tensioning keeps the left and right mouse buttons primed to click, reducing the force needed to click and delivering exceptional click feel, response and consistency. For more than 30 years, Logitech has been leading innovation and advancements in the audio, office and gaming technology spaces. Logitech’s high-quality products focus on the experience and help you realize your full potential. Each piece of gaming gear is designed and tested in our state-of-the-art research and development labs, and held to the highest performance standards to bring you the optimal gaming experience. *Changing lighting settings requires Logitech Gaming Software. Learn more about lighting here. *Changing DPI settings from defaults requires Logitech Gaming Software. *Changing onboard memory settings requires Logitech Gaming Software.